Writing this in the middle of January 2016, a time when Sanders’ presidential candidacy has being taken seriously by the opposition and the mainstream media. Although on the campaign trail he has drawn large crowds and has a sizable “war chest” filled with small donations, and his poll numbers have been more than respectable, his candidacy has been widely considered on the “fringe” and would go away at some point. 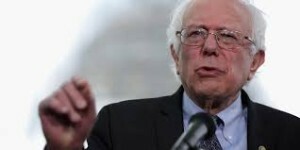 However, after the latest Democratic presidential debate in South Carolina, Sanders and his issues are at the center of the nomination contest for the Democrats. 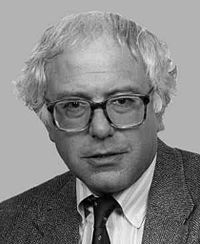 Since 1981, upon becoming mayor of Burlington Vt., as a socialist (actually social democrat) and then as a member of the US House and Senate since 1988, Sanders has been an outsider unafraid to take on the moneyed interests that have increasingly dominated American political and economic life. Now some pundits are conceding that he may represent the Democrats’ base voters than does Clinton. This is a fine time for a close look at Mr. Sanders from an astrological perspective. For this profile I am indebted to one that appeared in the New Yorker last October 12 by Margaret Talbot, “Populist and Prophet”. Talbot fills in a lot of the biographical details and provides a strong sense of his personal style. If you have followed the life and career of Sanders since his first term as mayor of Burlington, you know that he’s been unyieldingly “on message” for the past thirty-five years. In terms of personal style, Sanders is focused, combative. There is something of the Hebrew prophet Jeremiah in Bernard Sanders – just substitute “greed” for “idolatry”. From the Christian Bible, there’s something about chasing the money-lenders from the temple. Here’s a typical Sanders statement, made in response to Anderson Cooper on CNN whether he considers himself a capitalist: “Do I consider myself part of the casino-capitalist process, by which so few have so much and so many have so little, by which Wall Street’s greed and recklessness wrecked this economy?” No, Sanders says emphatically, he is not a capitalist. Sanders flourishes when there’s a clear enemy in his sights and his natal chart confirms this. Natal Chart – Click to open larger image in new window. Nobody was able to furnish a birth time for Sanders, then several weeks ago a chart from a previous astrologer appeared on Facebook. It gives Sanders a birth time of 12:27 PM that gives him 25 Scorpio rising. As we will see below, there is plenty of justification for this particular Ascendant. However, merely an Ascendant in Scorpio seems plausible for him. It points to Mars (not Pluto!) as the planet who governs his Ascendant, and it is a very prominent. We’ll also see First-Seventh house polarity that is fitting for a person who defines himself through his opposition and is unafraid to be seen as tilting at windmills as long as he stays engaged on what is important. Yet he comes across not as angry but passionate, is in generally good humor, and there seems nothing mean-spirited about him. Sanders shows dimensions of both signs that govern Mars – Scorpio rising is focused, deliberate, and unchanging; Aries gives Mars chutzpah and spontaneity, but can cause difficulties. Being out of sect in his diurnal chart, Mars in Aries can be aggressive, impulsive, even nasty. From his public appearance Sanders is not afflicted by this kind of overwrought Mars. Mars is in the Sixth House (or Place). Although Mars is in its “joy” in the Sixth, this place is also cadent and disconnected from the Ascendant: a planet there does not express itself well for itself alone. If you look at the old descriptions of the Sixth – forgetting its alleged affiliation with Virgo – the Sixth House or Place is that of adversaries. Mars here does well when there is something to fight against. For Sanders, not a problem. The Lot of Spirit, the positional symmetrical to the Lot of Fortune from the Ascendant, at 19° Aries, is conjunct Mars and is governed by Mars. The Lot of Spirit, in contrast to the Lot of Fortune, portrays a subjective range of life whereby we make decisions and handle what life deals us (fortune). To wax psychological, we could call the Lot of Spirit our motivating energy. For Sanders it’s a fighting energy that will make choices based on obstacles and oppositions to overcome. Moon is also in Aries, right next to the Lot of Spirit and Mars. Moon in Aries is not like Mars because it is the Moon: responsiveness and reactivity, somatic and emotional sensitivity, the “commoner” luminary in contrast to the more aristocratic Sun. Moon describes our “comfort zone” – one that is not always comfortable – in our daily lives. Moon in Aries depicts one for whom life needs to be an adventure, who is nourished by inspiration and adrenalin even on a boring day. Sanders has strong automatic responses that he cannot always keep in check; more positively, he has a youthful quality that contrasts with his numerical age. I have noticed that in the Democratic debates he uses more volume than necessary: this may be the result of too much time on the campaign trail or just being overly energized by nature. Sanders’ Mars forms an opposition to Venus in Libra in the Twelfth; these planets are the First and Seventh house rulers. This heightens the adversarial quality of his chart, beyond what his strong Mars can do on its own. This will effect his personal life; although he seems quite amiable and he has surely matured over the decades, I doubt that Sanders is always a joy to be around. If the First is about oneself, the Seventh is that of the other. Looking at the Seventh House we see Saturn in Taurus close to an opposition to his Ascendant degree. Before the large banks got into speculative and unstable financing, they would be represented by Saturn in the fixed earth sign Taurus. 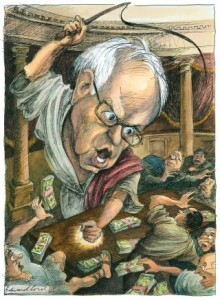 Yet Sanders’ depiction of the financial industry and its beneficiaries as solid, implacable, and bloated appears to fit well with this symbolism. Although Moon is conjunct Mars, Moon’s next application is to Jupiter in Gemini. Jupiter is in sect in Sanders’ diurnal chart and thus in a favorable environment, even if Jupiter is in detriment and in the rather obscure Eighth Place. Sanders’ guiding principles are in conformity with his upbringing in the liberal Jewish community of New York, and grew up in the shadow of Hitler’s holocaust and later was strongly motivated by the liberal causes of the 1960’s. 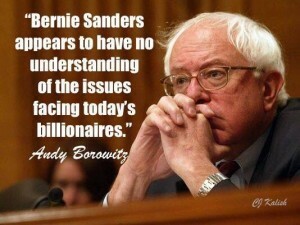 Sanders is not a scholar or an intellectual but more a conviction politician. His tenure as mayor of Burlington VT and his occasional work “across the aisle” shows that he far more pragmatist than ideologue. Jupiter is also close to the Lot of Fortune. Ancient astrologers frequently assessed planets in houses not only from the sign of the Ascendant but also from the Lot of Fortune. Whereas the Ascendant and places from the Ascendant refer to the general condition of the native, those from the Lot of Fortune are about the turnings of fortune – areas of our lives over which we have less direct control. Mercury in Libra, lord of Fortune in Gemini, is in the Ninth House/Place from the Lot of Fortune. Mercury is still cadent in the Ninth from Fortune but does have a trine relationship by sign to the Lot. Along with a prominent Mars comes a complex and interesting Mercury. We will say more below about this planet. Sanders’ Sun is in a sign renowned for its practical problem-solving abilities. It’s in an extroverted place in the Eleventh and it has a square from Jupiter that adds a forward-thinking quality. It’s important to note that in spite of strong differences of conviction Sanders had worked with different politicians and even business people on areas of common interest. 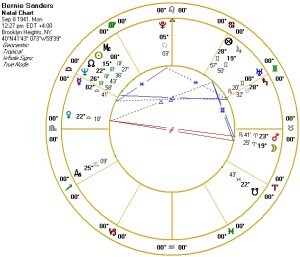 With his Libra Mercury and Venus, Sanders can balance penchant for combat with willingness to compromise to advance his purposes. Ordinarily planets in the Twelfth House are hidden and difficult placements since the Twelfth is cadent and its sign makes no aspect to the sign of the Ascendant. Yet Mercury and Venus in the Twelfth contribute to Sanders’ success as a politician and public figure. How? Here we look at the factor of symmetry, in his case noting planets that are symmetrical to the axis of 0°Aries /0° Libra, sometimes called in contra-antiscia or having the Aries Point as midpoint. If we add up the degrees of two positions in Libra and Virgo and find that their sum is close to thirty degrees, these two positions form symmetrical relationships to the Aries-Libra axis. Venus-Midheaven are 22° and 8° of Libra and Virgo respectively, and so are equidistant from 0°Aries /0° Libra within one degree. This helps explain Sanders’ general likability that has been quite an asset to his life as a public figure The Midheaven degree is a place of connection between the person and the larger world that can be career or lifestyle in relationship to one’s culture. Venus is of course the planet of art, enjoyment, and – especially in Libra – personal affiliation. Or maybe he missed his calling as the leader of a punk rock band in the 1970’s. Mercury and Neptune are only a few degrees apart from one another and would be in conjunction with each other except they are in different signs. Yet Neptune is 27° of Virgo and Mercury is 2° Libra, and are also equidistant from 0°Aries /0° Libra. This pair, along with the close trine between Mercury and Uranus and the sextile between Mercury and Pluto, give an idealistic, intense, and innovative slant to his ideas and his thinking in general. It is primarily through Mercury that the outer planets manifest in his chart. Nobody should be surprised, since Mercury is a planet of politicians and he’s a rather unusual one by today’s standards. Now we apply to Sanders’ birth chart and life many predictive indicators used by modern and traditional astrologers. Can we find indications for his surprising insurgency campaign? How does this year bode for Mr. Sanders? It’s also a chance to look at predictive indicators side by side, their logic and range of application, and perhaps assess them based on how things turn out for Sanders. Let’s begin with another important time in Sanders’ life, his election in March 1981 to be mayor of Burlington Vt. , an election won by only a few votes that launched his political career. Mr. Sanders was not born politician. Although he was a political activist in his college days and as a young adult, he also tried a variety of careers with no discernible success. He had appeared several lines down as an alternative and unknown candidate for state offices in Vermont, with the fate normal for fringe candidates. In 1980, however, a friend suggested that he run for mayor of Burlington as an independent. Later that year he unseated the Democratic incumbent – by only a few votes! This is an important time to look at astrologically. Here are his transits in graphic ephemeris form and it’s a thing of beauty (click the image to open a larger version in a new window). The positions of natal planets are the dotted straight lines from the right and the transiting planets are the moving lines that start from the left. An intersection between a moving and a straight line is a transit, a conjunction, square, or opposition. Looking at the top left of the page, October and November of that year, we see that Saturn and then Jupiter are crossing his Mercury in Libra; and looking at the middle of the page vertically, you may note Uranus conjunct his Ascendant &8212; all this feels like the beginning of an insurgent campaign, albeit with obstacles and difficulties (thank Saturn). Glancing up the page into 1981, note the Pluto transits that Sanders to his Venus, Moon, and the Mars. Remember also that natal Venus is symmetrical to his MC degree along the Aries/Libra axis and there’s the possibility of a major change in his public identity. More dramatically Pluto is at a retrograde station opposing his natal Mars. Pluto transiting Mars brings further intensity and darkness, possibly underhandedness, to an already strong Mars placement. Further research may disclose how such a strong Pluto transit would manifest in a mayoral campaign. 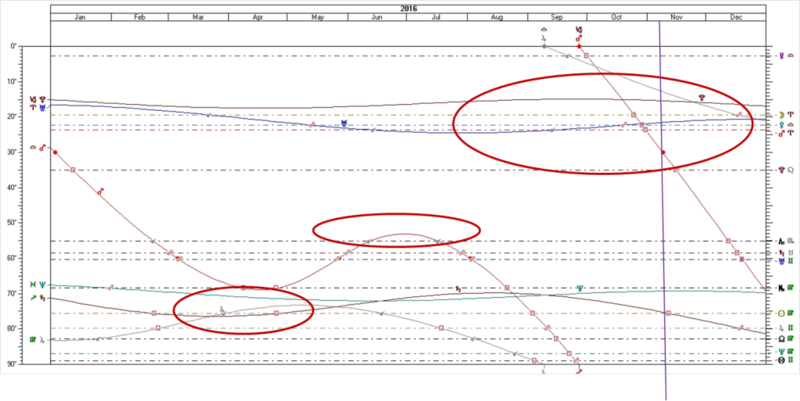 Finding the blue moving line shows that transiting Uranus past its conjunction to Sanders’ Ascendant and in late December was opposed his Saturn. Transiting Uranus brings the surprising and the unconventional, to Saturn that represents density, focus, and often the cold backhand of conventional reality. It may also represent his insurgency taking the battle to the structured and rigid. Then, in the month before the election and when the results came out, transiting Uranus was in opposition to natal Uranus! It sometimes happen that this transit which happens to everybody in their early 40’s signals a life pivot; this certainly was the case for Bernie Sanders. Moon-Sun from March 1980 until autumn 1981: Moon-Sun may indicate a move into prominence, or at least greater visibility. The zodiacal releasing from Spirit was the major sign Gemini (the sign of his Fortuna and Jupiter) and the specific sign Aries until January 1981. The last two months of the campaign featured the sign Taurus, his Seventh Place and where his natal Saturn resides. A tough slog it must have been. I start with the conclusion: Sanders will continue to be a figure of national importance during this year; is he not going away quietly. However, using a morning birth time, Hillary Clinton’s progressions are rather impressive for the autumn of 2016, so I do not count her out of becoming US President at the end of the year. Nonetheless, Saunders’ influence on the American political landscape will be lasting. Let me make the case. Sanders’ transits, especially when we compare them to 1980, show a year with peaks and valleys and a lot of energy and prominence. Here’s the graphic ephemeris for this year (again, click the image to open a larger version in a new window). Here’s yet another Jupiter-Saturn aspect in the sky, this time a square involving Jupiter in Virgo and Saturn in Sagittarius. During the spring and during the autumn Saturn and Jupiter transit Saunders’ Sun in Virgo and his Jupiter in Gemini. Transiting squares do not necessarily connote difficulties but we must instead look at the transiting planets involved. Transiting Jupiter is a good omen and transiting Saturn is not. This spring, during the presidential primary season, both Jupiter and Saturn are transiting Sanders’ Sun. This bodes mixed conditions at that time. Mars is also doing some interesting things in the spring and summer for Sanders. 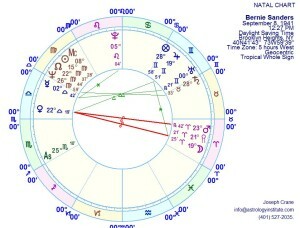 At the time of the Jupiter/Saturn transits to his natal Sun, transiting Mars makes a square to his Midheaven degree. I give much more significance to a transiting planet conjunct or oppose the Midheaven degree than making a square to it. I will be paying close attention at that time to see whether this square is a factor for Sanders. Far more significant, it seems, is that in the late spring and early summer Mars is at a direct station in conjunction to his Scorpio Ascendant. No going away quietly, or doing anything quietly. 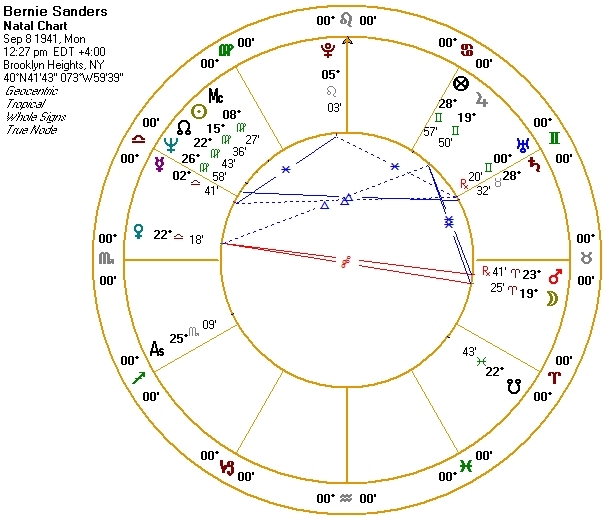 The bad news for Sanders may be that on Election Day (see vertical purple line) transiting Saturn is in square to his Sun while Jupiter’s transit has ended. Saturn is not the transiting planet you want to influence natal Sun at this time. Jupiter begins to transit his Moon-Venus-Mars configuration but not until the following month. Enter Uranus. You may see that Uranus transits the configuration of Moon, Venus, and Mars. The graphic ephemeris clearly shows that when Uranus goes direct it will be in close conjunction with Sanders’ natal Mars. Such a transit of Uranus to Mars may signify sudden physical difficulties (Mars is the Ascendant ruler and is placed in the 6th), accidents, or a concentration of energy and radical purpose. We also know by now that Sanders handles Mars influences very well. Yet Uranus always surprises us. Since this transit lasts several months we may see different manifestations of this transit. Sanders’ secondary progressions were unimportant back in 1980 but are far more prominent now. At the beginning of last year progressed Sun was in square to progressed Uranus signaled the beginning of a long-shot insurgent national campaign. He announced in May 2015, usually the last thing that happens after months of preparation. Sanders’ progressed Sun is currently in the last degree of Scorpio and enters Sagittarius on September 10, 2016. Secondary progressions often indicate slow structural transitions more than specific events; this one points to a previously Mars-like progressed Sun in Scorpio taking on more a Jupiter quality when it enters Sagittarius. Sanders’ decennials provide additional information. When his quixotic campaign began they were Jupiter-Saturn, not exactly a recipe for prominence, yet by early November 2015 both general and specific planetary rulers changed to Sun-Sun! As most of us know, by November he was playing to large crowds and had finally begun to attract attention from the media. This phase continues until the middle of June 2017 when they become Sun-Mercury. Before coming to a conclusion that Sanders’ presidential bid is a noble but ultimately losing cause, I need to discuss his zodiacal releasing from the sign of the Lot of Fortune. We discussed zodiacal releasing from the Lot of Spirit when discussing 1980. The Lot of Fortune, however, pertains to the vicissitudes of circumstance around the person. Currently Sanders is enjoying a Virgo-Aries phase, one that adds Mars and a Mars rulership from the ruler of Aries to the larger phase that began in 2004 and is oriented toward his Sun in Virgo. The Aries phase ends in March when Taurus (and its ruling planet Venus) takes over as specific indicator. Since Taurus is Sanders’ Seventh and Saturn is there, one must think of intense and stubborn opposition to him. However, on November 3 his zodiacal releasing becomes Virgo-Gemini that accentuates his Jupiter that is in Gemini. (Election Day is November 8.) Similar to his secondary progressed Sun changing from Scorpio to Sagittarius, here we also see Jupiter taking on from Mars. Putting all this together, they seem to transcend questions of winning or losing specific political contests and more about growing personal prominence and authority. It’s entirely possible that Sanders becomes an elder statesman without having to be President first. His astrological indicators may help bring and help him sustain national prominence, portending a positive outcome for his cause if not for his Presidential aspirations. I think Sanders would be okay with that. Alan Oken mentioned A possible Gemini rising since he uses his hands so much when he speaks? Bernie Sanders was born right after a lunar eclipse, the eclipse of Tuesday is right on that eclipse point along with Neptune, the ruler of the eclipse, and is opposing his Sun while squaring his Jupiter . Meanwhile, Saturn opposes his natal Jupiter, and Jupiter squares it natal self. And if that were not bad enough, Mars in comjunct the ASC opposing his natal Saturn & Uranus and squaring the MC. It’s a bad eclipse chart, a quite horrible one actually. Hi Trish and thanks for contributing and sorry it took so long to write back. I think of eclipses bringing a surprising and uncanny quality to events and maybe the Michigan primary results attest to that, basically saving his candidacy from irrelevance. I don’t use Neptune as ruler of an eclipse in Pisces but would go to Jupiter that has been involved with his Sun lately. Also, the Saturn transits oppose his Jupiter don’t happen until late in the year, after the rather grim Saturn square Sun. Mars in Scorpio has been a good thing for him, since he has Scorpio rising. It has given him great endurance although he seams were showing at last Sunday’s debate. He could use some down time in Florida, like many others his age! Great article. But what is the astrology of the convention? Isn’t a Saturn transit an indicator he could win? After all, it’s the worst job in the world. His correct height is about 6 ft. (Sagittarius tends towards tallness) though it has been incorrectly reported some places as 5 ft 8 in. He is said to stoop though. I haven’t found a web site that shows which signs are inclined to stooping but it just doesn’t seem like a Scorpio trait. Also, at least one source states that Sagittarius rising is said to result in white hair in advanced age. However, the fixed signs rising tend towards a square jaw. His jaw looks someone square I’d say. Also, even though he owns a red tie or two, he apparently prefers blue ties (or blue mix) with blue shirts. Blue is not a Scorpio color. He has just lost the CA primary which he really needed in order to continue his presidential bid but Jupiter is transiting his sun again and Uranus his Mars, so something is about to happen here that may be totally unpredictable so I won’t try to predict it. Re the CA primary….they are still counting votes and I believe at least 4 counties have flipped to Sanders. I think we are in for some surprises before all is said and done.